SCOTTSDALE, Ariz., October 5, 2018 – Children’s Learning Adventure enables students to discover their true potential through STEAM-based learning. They encourage their students to take an innovative approach to learning with a wide variety of science, technology, engineering, the arts and mathematics activities. This supports students with the development of both their problem-solving and critical-thinking skills. As students engage in daily exposure to STEAM-based learning, Children’s Learning Adventure supports and enhances every child’s opportunity for success and the ability to apply newly learned skills while developing in all academic areas. Children’s Learning Adventure understands that children are born with a vast capacity for learning. The early developmental years are critical for expanding a child’s brain. Their curriculum incorporates the latest brain development research and implements simple, yet intricate lessons to maximize learning for each child. STEAM-based curriculum is incorporated into all programs to ensure each child is learning valuable skills. Science is an integral component of STEAM-based learning curriculum. Students are presented with specific instruction providing opportunities for rich vocabulary learning, collaboration with peers and acquisition of scientific knowledge. Children’s Learning Adventure’s Laboratory Lagoon® sets the stage for investigation, discovery and experimentation, enabling students to take an in-depth look into scientific procedures. Children’s Learning Adventure science curriculum engages students in hands-on learning activities to spark curiosity and open new avenues for scientific engagement. Children are prepared to live in a technology-driven world by incorporating the use of technology into STEAM-based curriculum. Children’s Learning Adventure has brought technology into their classrooms to give their school age-students the opportunity to sharpen their technology skills through tablet-based assessments. While it is necessary for students to get this hands-on experience, they also benefit from their teachers using Smart Board Technology to improve their classroom instruction. In providing a loving, nurturing environment, Children's Learning Adventure helps children become confident, independent learners who develop a strong sense of self-worth, enabling them to make positive life choices. To ensure that every child has the proper tools to grow, engineering is incorporated into STEAM-based learning curriculum. Engineering is simply designing, building and using structures and machines. 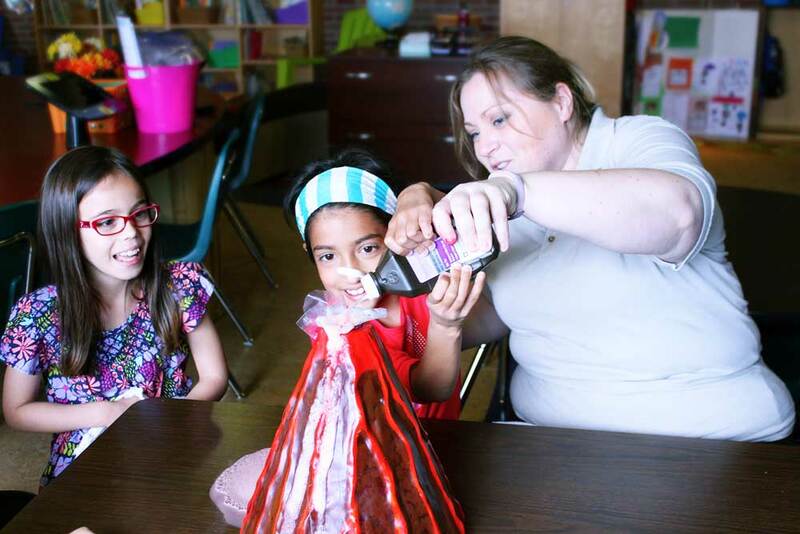 By infusing engineering activities into the STEAM-based curriculum, Children’s Learning Adventure builds on a child's natural problem-solving skills, building the foundation for critical thinkers. Children’s Learning Adventure believes students should be given the opportunity to express themselves creatively. The arts are incorporated into their STEAM-based learning curriculum through the implementation of art, music and drama lessons in the daily activities. We know that exposure to the arts is fundamental for early childhood brain development, as it allows children to express emotions and feelings in a positive and healthy way. Mathematics provides the foundational building blocks for academic success. Mathematics can be applied to essential life skills and is incorporated into several other subjects and everyday interactions. At Children’s Learning Adventure, students develop a conceptual understanding of numbers, combinations and operations. In addition to number knowledge, students learn shapes and their structure, reasoning, measurement, classification and patterns. These mathematical skills are incorporated in the STEAM-based learning curriculum. Students gain hands-on acumen of these mathematical skills while participating each day in learning opportunities in the classroom. Children’s Learning Adventure’s CEO Rick Sodja has encouraged his centers to embrace Lifetime Adventures® STEAM-based curriculum, based on the latest brain development research, providing children with the activities and environment to greatly impact their capacity for learning and later success. Children’s Learning Adventure is holding open houses across all their locations on Saturday, Oct. 13, 2018. Families can stop by any time between 10 a.m.-1 p.m. To learn more about Children’s Learning Adventure or their STEAM-based curriculum, please visit www.childrenslearningadventure.com.